This MSci offers an additional year of study on top of the equivalent BSc, during which students have the opportunity to specialise further by taking more advanced modules, and undertaking a major project. No previous knowledge of management studies is required. In the first two years you will receive a thorough grounding in pure mathematics and mathematical methods following the same modules as the single-subject Mathematics students, taking 3.0 credits of pure mathematics/mathematical methods each year. In place of the Applied Mathematics modules you will take two half-credit modules in management studies each year. Having laid the basic foundations there is a wide range of options in both mathematics and management studies in the third and fourth years. You will undertake a major project in your fourth year, which will include a substantial piece of written work and a presentation. 1.0 credit of third- or fourth-year mathematics or suitable fourth-year management or approved outside options. 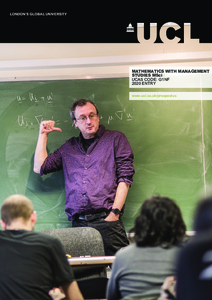 Detailed course descriptions are available on the department website: Mathematics with Management Studies MSci. The department is suppoprtive of the Year in Industry scheme which involves deferring entry for a year to gain valuable work experience.